So, we made it through Halloween – I think it was the garlic myself. Garlic is so effective at keeping ‘things that go bump in the night’ under control, that even witches have been known to carry it with them – to protect themselves in case things go wrong. This seems a bit defeatist to me, I must admit. Wouldn’t it be better just to learn the spells properly and then you wouldn’t need to worry that they might get out of control? I know that there are hundreds of spells to choose from – that’s why you have to have a spelling book if you’re going to be a witch. Surely witches don’t just go round casting spells at random? If they are going to cast a spell then they must know before-hand what they want to make happen, so there should be plenty of time to read up on the correct procedure and make sure that you have all the ingredients and that the moon is in the right place and you have the correct cat who has the required degree of blackness. You will also need a cauldron of a size large enough to hold all the ingredients without too much slopping out when you stir – you wouldn’t want to put the fire out in the middle of it all now would you? If you’re going to go to all this trouble – surely it’s worth learning the spell properly before you start? Then you can use the garlic to make a nice spaghetti bolognese to warm up in the microwave afterwards. 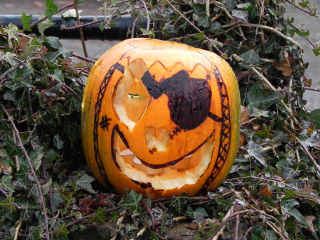 PS This Pirate Pumpkin was sitting outside one of the houses we pass on our daily walk. We knocked, to say how much we liked it and found an authoress who has just published her first book – it’s here, go and have a look. On The Beech Is it a train? Is it autumn leaves? No its . . .